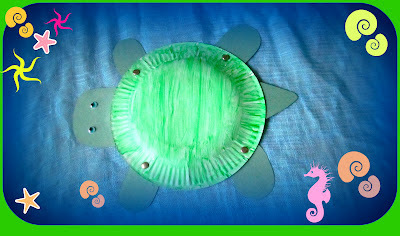 Child care, education, games, safety Childcare: How to make a Paper Plate Turtle? Children are always interested in animals, and the nature around them. With this project you can achieve a big success with the children, as they generally speaking, love animals. With this art activity you will promote children’s interest in art and also their curiosity by exploring different techniques.You will help children to develop their intellectual knowledge as they will review the shapes and as you introduce them the primary and secondary colours. This activity will help the children in their physical development such as gross motors kills and fine motor skills. (Using brushes children will improve their hand-eye coordination skills.) Painting is always fun and children can express themselves and use their creativity. This activity will teach children to socialize as they take turns and share materials provided. Introduce or review shapes: circle, oval, and triangle. · Have children paint or colour the bottom of a small circular paper plate green. Allow paint time to dry. · Glue the large oval (the head) and the 4 smaller ovals (the legs) plus the triangle (the tail) to the paper plate. You can use stapler or other staff to fix the legs. · Draw eyes on the head or glue on googly eyes. Put some glitter or patches to the turtle's back if you like. · Get ready to read (or listen to) books about turtles.